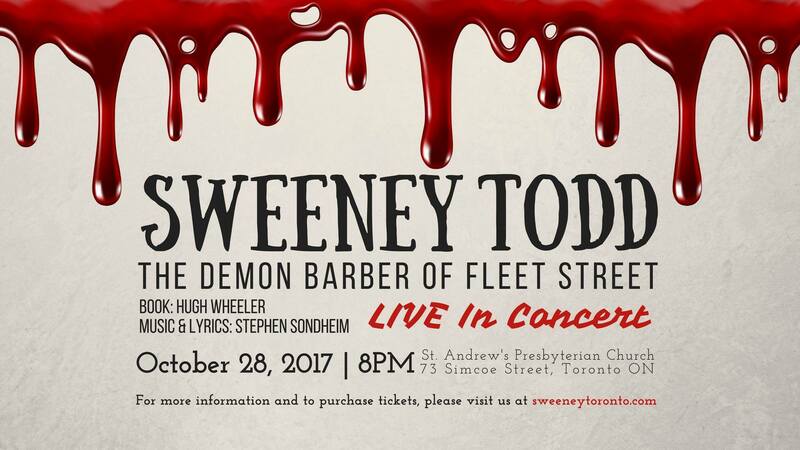 On October 28th for one night only, Co-Producers Nicole Strawbridge and Colin Frotten put on Sweeney Todd the Demon of Fleet Street at St. Andrew’s Presbyterian Church in Toronto. For those of you who are not familiar with the story; an evil Judge named Turpin pines for the wife of a London barber named Benjamin Barker and sends him to Australia for a crime he did not commit. After 15 years he returns to London and is now calling himself Sweeney Todd. Sweeney Todd meets a Mrs. Lovett, and the two devise a plan to get an endless supply of free meet for her pie shop, and for Todd to get revenge on Judge Turpin. For those who are unfamiliar with St. Andrew’s Presbyterian Church, it is a large church with a balcony in a “U” shape facing a small stage, crowded with heavy wooden furniture. I have to admit that I wasn’t sure how this production could be performed in such a small space. The manner in which director Noemi Parenteau-Comfort utilized the available space on that stage was nothing more than impressive, especially considering there was a cast of 28 actors. Parenteau-Comfort’s use of levels, sight lines, perspective, and space ensured a visually compelling performance that kept the audience captivated throughout the play. One of the most impressive things I think a director can do is make transitions between scenes seamless and interesting, Parenteau-Comfort was quite successful in her execution of the transitions. The first half the play began on a rough note as the balance between the mics and the orchestra was off, making it difficult to hear a lot of what was being said and sung. Much of the crucial exposition of the show was missed by the audience due to this mishap, and many who were unfamiliar with the show went into the intermission feeling confused. One of the major pet peeves of mine when seeing a musical is when the orchestra drowns out the actors; the musicians played beautifully (in many parts thanks to the very talented Music Director Sam Moffatt), but if the story cannot be heard or understood, then there really isn’t a point in seeing the show at all. Thankfully, the production had many redeeming qualities. Aesthetically, it was appealing, with simple but effective costumes. The effective way that set was used in the show was clear, minimalistic and imaginative; one would think that you couldn’t do Sweeney Todd without a barber’s chair, but it wasn’t missed. The shining star of the show might have just been the ensemble, as they were captivating, entertaining to watch, but did not distract from the story. At the top of the show, the ensemble was visibly sitting upstage centre, in grand wooden chairs; which created another visual element for the audience’s eye to go to, so that the chorus became part of the set. Unfortunately this wasn’t a permanent fixture, which left a majority of the performance space looking bare at many points of the show. Some of the best pieces were the group numbers, where the ensemble filled the performance space with their voices. With that being said, the sprawling ensemble was a little under-utilized throughout most of the show. The second act ran smoother, as the mic problem from the previous act had apparently been resolved; the actors’ beautiful singing voices could be heard, and the audience was able to follow along with the rest of the story. “God, That’s Good!” starts the second half off with a lively scene as patrons of Mrs. Lovett’s pie shop enjoy her meat pies and Sweeney works to provide more fresh meat. This scene was done beautifully to draw the audience back in from the intermission, with the ensemble crammed perfectly on stage create an exciting opening number. One thing I felt was lacking in this act was dramatic flare when Sweeney Todd kills his victims, it felt quite reserved and anti-climatic, as once their throats were slit, in an unenthusiastic manner, the victims simply stood up and walked away. There was a lost moment near the end of this act where the dramatic irony of Todd unknowingly killing his own wife was lost. The impact of this moment can only truly be effective if the audience is truly aware that the Beggar Woman is, in fact, Todd’s long-lost (and thought to be dead) wife. This production fell short in this respect. Overall, the cast of this production of Sweeney Todd was incredibly talented, but there were a few performances that truly caught my eye. Michael MacEachern ‘s portrayal of Tobias Ragg was sweet, endearing and sincere; during “Not While I’m Around,” he captured the attention and hearts of the audience. Gabriel Vaillant’s Beadle was enjoyable to watch; his physicality, and inherent humour and comedic timing worked perfectly for his character and added a much-needed levity to the show. Jada Rifkin as Beggar Woman was at times quite chilling and you really couldn’t help but feel bad for her. Not to mention that Rifkin’s voice is stunning, and was one of the only voices that could be heard over the pit-band in act two. I hope that Nicole Strawbridge and Colin Frotten continue to collaborate together. As an overall product, this was a very well done production. I look forward to seeing what they come up with in the future and would highly recommend keeping your eyes out for their next production, whatever it may be.